In all seriousness, The Escapists 2 is a jail-break game that pits you in different types of prisons and demands of you a single main objective: Get out! The earlier prisons are fairly easy, with guards that act in an expected manner and let things slip by. 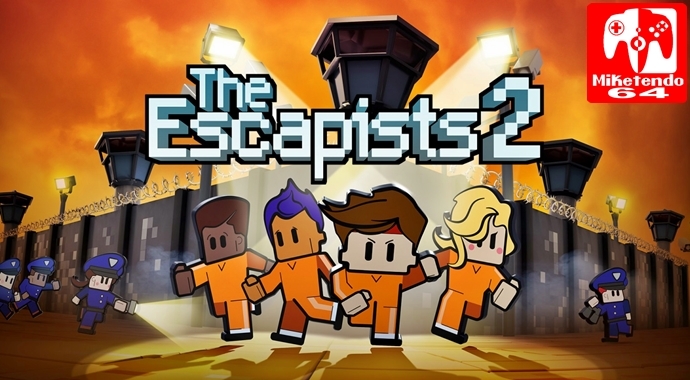 But in the later prisons, The Escapists 2 turns up the heat, as things get way different! The game gets harder and escaping becomes more and more impossible, but it’s all part of the fun. As far as the basics of The Escapists 2 goes, you are an inmate, living your life in prison, with dreams of escape. It sounds simple enough, but the game really expands after the tutorial. You have daily tasks to do and daily events to attend to. Eat lunch, workout, do jobs and then there’s your free time. This is when you can start planning your escape. You gather materials, do some crafting to create different items. You must also do diverse things to make these items. Diverse things such as, gain intelligence, gain knowledge, gain muscles, and gain money. Personally speaking, this is a cool concept, as it is something I liked, as it is something that makes The Escapists 2 feel extra special, really unique and succeeds at it rather well. While you are planning your escape, you must also learn the movements of the guards and items they have, then make your plan. You have to think about everything. Missing a small detail can screw up, what would’ve been an amazing escape. “Next time I’ll cover my cell bars…” But trust me, when you do pull off that escape, it feels great. You feel like a genius. A mastermind. Of course, you aren’t alone and your prison pals have their own missions and can give you gold and objects in exchange. As I said before, as you escape more and more, you’ll find yourself in bigger and tougher prisons, as the game gets harder and more complicated. But as things get hard, the escapes get more and more spectacular and bigger in scale. You’ll even feel even better each time you do and yes, multiplayer is fun too, I just didn’t put in as much time into that mode as I could have done. Another cool aspect to The Escapists 2 that I liked, is the customizability of the game! I liked naming the prisoners after my brothers and friends, with police officers and guards being named after parents and adults I know! But what of the visuals? Well, the art is special and it works well for a game like this, however musically, there is nothing notable. It’s not bad, just not special. Still, with so many strengths, The Escapists 2 is a solid game! There are a few flaws present, which mostly comes to daily prison life, as I wish there were more options to do. Making amazing escapes are one thing, but then when you start again it feels like a drag. You have to initially do the daily tasks then re-acquire the different skills. Then as it gets harder, each escape takes longer. It’s not the game’s fault but it’s more or less to be aware of. Also, more ways to play would’ve been cool! I feel that they could’ve made more new modes and set different rules. More customization over the course of the game. Still, it’s ok what we do have and it’s pretty great! Overall they didn’t really negatively affect gameplay, but they did leave me wondering what it would’ve been had it have more? What can I say? I really like The Escapists 2 a lot. The concept is very fun, it is executed really, and it’s original. It goes without saying, originality is an important factor especially with the indie scene rising and The Escapists 2 certainly stands out, thanks to its originality. There’s nothing quite like it on the eShop and it’s amazing, because unless you play an Escapists game, you’ll never play something quite them anywhere else. Admittedly, there could’ve been more to it, because there are so many ways to improve it so that The Escapists 2 could shine as a must play indie game of this generation, but it is what it is and even then, it’s a blinder of a game!